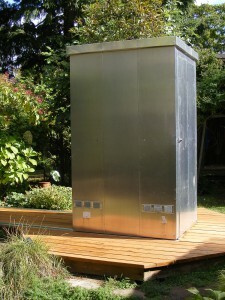 The Astrocloset is a small aluminum building that provides a secure, vented cover for a telescope which could be set on a deck or concrete surface. To move the Astrocloset off your telescope, the locking door is opened and each corner is unlocked. The building is then simply pushed to the other end of the rails, uncovering your scope. The Astrocloset is then locked down again. 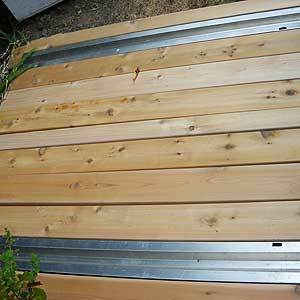 Intermediate railing is available, if you need to move the structure further out of the way. 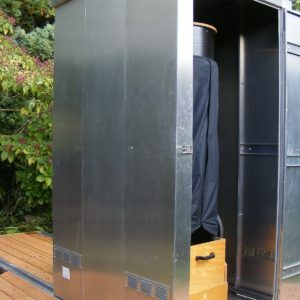 Your Astrocloset can then be used as an imaging station, with optional fold-down desk with shelves, and/or as a warming station for you and your “Star Party” guests. 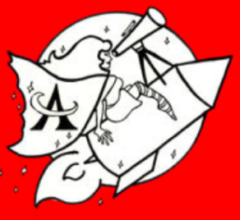 Get ready to be spending a lot more time using your telescope! Your scope will have to pass through this opening, as the building is pushed back. Custom sizes are available to accommodate larger equipment. Your Astrocloset can be aesthetically enhanced with decorative flowerboxes to provide greenery and eco-friendly cooling, and interior insulation, both of which are available in our shop. The Astrocloset is shipped disassembled, and it is easy to build in a few hours*. Its assembly is similar to that of a large Erector Set™! Instructions will also be available online. * Not including deck, pad, or pier construction.